The tribal Samnites' nations arose from the evolution of the peasant and sheep farming societies that, since the very beginning, inhabited the peninsula. The people of Samnium were not organized by a municipal government or city-state. In fact no populous areas existed that would head the nation as in the case of Rome that stood for the Romans. 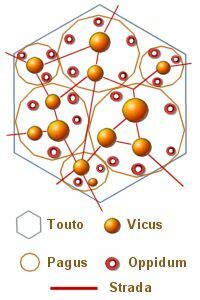 The political and administrative unity was constituted by the touto, a system based upon corporate nature, whose concept was of a meaning larger than the roman "civitas" (a framework specifying core ideas for civic education). As a matter of fact, among the Samnites one cannot find a minimal relation to the roman concept based upon individual and predominant characteristics. The Samnites were foreign to the concept of the city - state whose territory is included in the urban centre. Rather, they believed in many urban agglomerates where the tribes would conduct their social and economic business. At the basis of the tribal community was the preference of the community, the people within, their cities and villages. The political unity placed beneath the touto was called pagus. It represented administrative sub-unity that pertained not to a single city rather it formed a district that could have included populous areas. known as Pagus Aeserniensis. The city proper, at times fortified, extending into its lowlands was called vicus, while the mountain counterpart was called oppidum. Neither of these two terminologies reflected a political life per se, hence the pagus contained a semi-indipendent district interested in social, farming and above all in religious aspects. The pagus was responsible for the military enlisting. The assembly of its members would vote the local laws and elect its delegation to its touto board. During their history, the Samnites numbered four fundamental touto, namely the Pentri, Carricini, Irpini, and Caudini, and, after the annexation later on, the Frentani as well. Each touto kept a sacred place for their administrative duties even though this enclave was not recognized as the capital city. The Pentri called this special town Bovianum Vetus, today's known as Pietrabbondante, the Carricini called it Cluviae, the Caudini Caudium, and Malies or Maloenton (Beneventum) for the Irpini. Each and every touto constituted a republic, not a kingdom, with its own council and assembly. It could have been that at one time, as in the case of the Romans, they may have had a king, but it is so far back that in the oscan language one cannot find the corresponding word for king. It is also true that throughout its history the Samnites were definetly anti-monarchic. The Samnites' state was not only republican but democratic as well. They elected their representatives and publicly and openly criticized them as well. They did not have rich and potent families that could influence the voting process and wealth was not enough to advance the candidates. When the writer Livius spoke of "Vir nobilis potensque" he was describing people known to have excelled in the political samnitic life for military and diplomatic importance. 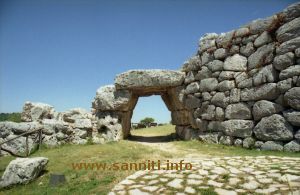 Stone walls and gate of an oppidum. That they had achieved some political weight gained in the field, weight that could have been used economically later on but not the opposite. They were not large in numbers and would not allow their leaders to ascend to higher offices if not for their personal prestige. The leader of the touto was called Meddix Tuticus, democratically elected, whose office was the equivalent to the roman Magistratus or Counsul. In discharging his supreme duties he was helped by lesser officers. Among these the Meddix Minor, sort of a quaestor in charge of individual pagis and Meddix Aticus in charge of the fiscal administration. A similar office for administrative duties of the Meddix was called Kensur, from whom the Romans derived the name of Censor. The Verehia or Verreia was a samnitic organization that oversaw and performed governmental as well military duties that indeed organized the youths in a way similar to the roman Juventus. The youths would then become Gates Keepers. Such an institution was needed to train young people for the military and equestrian endeavors. Toward the end of the IV century and the beginning of the III, the Samnites were to face severe threats from the Romans. 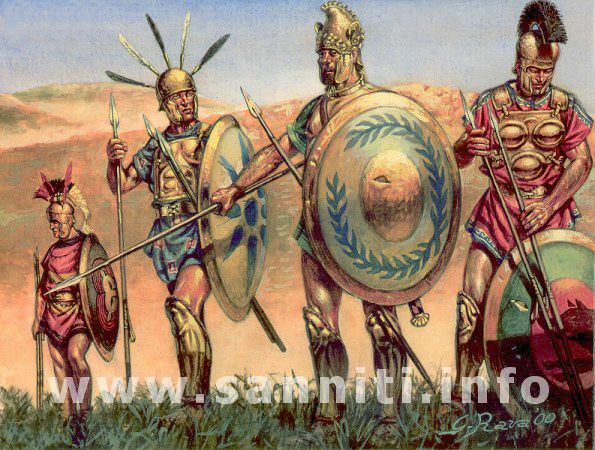 Several toutos got together with their neighbors and formed the Samnitic League. This was a governmental and militaty entity solidly bound into the willingness to fight the romans to the bitter end. Rome was not successful in placing one touto against the other as in their classic way Dividi et Impera, divide and command. Many joined in the league for example the Campani, Apuli and even the Lucani but no one was able to interest any of the members to take side against the others. This association among several samnitic tribes constituted the main aim in order to establish a stable warranty in case of wars and unite them in common peaceful times. 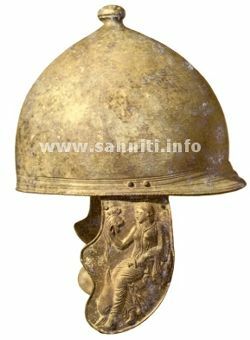 Not only military but also religious were the bonds tying the Samnites together. For the league also formed a council of Meddix Tuticus encompassing various associations to determine strategic adoption. Meetings on a revolving basis were held on each of the touto's sacred cities and in case of emergency very often were called to safeguard the interests of the partecipants. In military emergencies the Samnites elected a commander-in-chief chosen by the Meddix' Council.